A throwback blog post from 2012! Saxquest handed us our first opportunity for a performance and they have been steady supporters every year since. Recently an audience member said, "So, you really started this from nothing?" Yup, I said, from nothing. So we had our first meeting, we brainstormed, we got excited about all of the possibilities, and we drank more wine. We created a group email account, we sent dozens of ideas over email. We had another meeting (and more wine). We got lucky when Mark Overton at Saxquest asked us to put together something for a little mini-festival he put on in a tent behind his shop. We had our first gig! We decided to put together a whole season. We found a venue that would provide a space for us to set up a series of concerts, which was amazing. We celebrated, with just a little more wine. We fought about programming, we stressed about money, we experimented with concert formats. We struggled with the website, learned how to use social media. We were educated on the difference between PR and Marketing. We performed some great concerts, and maybe some not so great concerts. We built a board, we became a non-profit. We had our first fundraiser, created our first spreadsheet, and wrote and received our first grant! We've learned we have hidden talents that don't involve our instruments. We've learned we have limits and we've pushed them. We've learned the challenges and rewards of working with your friends. (How do you tell a close friend that she's out of tune or that you think her big idea isn't so big - how do you take it when you're on the receiving end?) We've learned to be vulnerable and to be tough. I think the most valuable thing we've all learned is to trust each other, both on and off stage. And we've also learned to stop drinking wine at meetings. Well, most meetings. 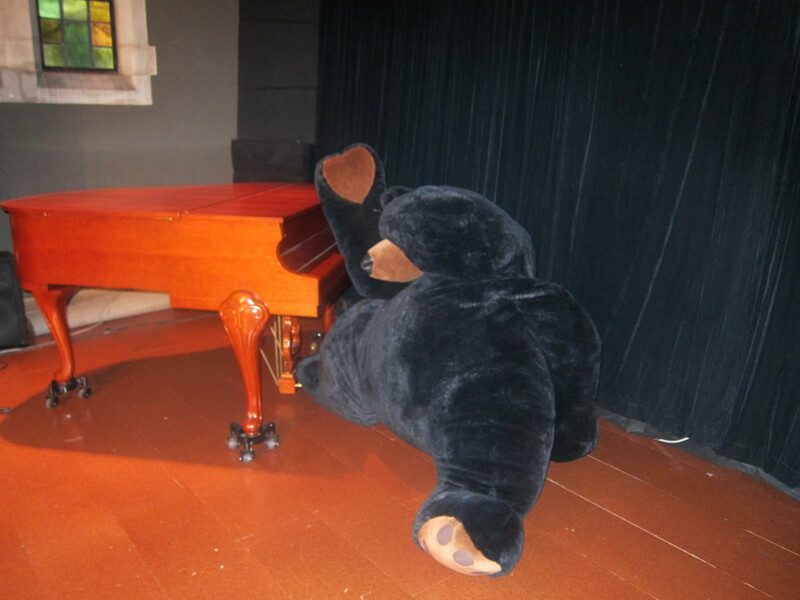 After a concert at The Wine Press, 2011? Most importantly we've met so many wonderful people at our concerts, building a common ground for all people to come together. We're excited to be playing the music of American composer Kenji Bunch this month. We got his CD Boiling Point and fell in love with the piece Drift and decided it fit perfectly on our DREAM program. Much to our surprise, when we got the music, it was not written out in traditional notation! We thought you might like to know more about how this works, so we've put together two blog posts about AUGENMUSIK (Eye Music). Bob Chamberlin from Webster University is going to share a short history of Augenmusik, including links to recordings in our second post, but first, we're going to hear from Kenji Bunch himself. We contacted Kenji on Facebook and asked him a few questions about his creative process with Drift. Drift by Kenji Bunch. All images used with permission. What inspired you to write a graphic score? As a performer, I've worked with a lot of graphic notation, from my years as violist in the Flux Quartet to my time as part of the performing composer collective Ne(x)tworks, a group that specialized in music of the New York School, the avant garde movement of John Cage and his contemporaries. Writing graphic scores seemed a natural extension of this work. What came first, the musical ideas or the desire to use this type of notation? What's the story behind this composition? I was commissioned by the Spoleto USA Festival to write a trio for clarinet, viola, and piano. For whatever reason, at the time I was working on the project, my schedule only allowed me to sit down at my desk and get to work rather late at night. After taking the necessary time to settle down and focus, so that I was actually ready to get good work done, I would be so tired that I'd literally be falling asleep while composing the piece. I realized that some quality musical ideas were drifting away into my subconscious mind, and if I was able to recall any of them later that night or the next day, they wouldn't be exactly the same. Then it occurred to me that there was potential for some interesting exploration about this notion of memory and transformation. In essence, the material in this piece develops not through the traditional compositional tools, but through the performer's ability to recall what he or she heard earlier in the work. Any "mistakes" in this recollection would be embraced as development of the material. And ultimately, the piece serves as a metaphor for the process of grief, which is really a confrontation and reconciliation with the idea that memories are inherently ephemeral, and can't be preserved without some kind of inevitable alteration. The music literally Drifts away sometimes. Did you experiment with and discard different ways of writing the same material? Did you rearrange the order of the material or movements? I actually tried valiantly to write this piece using traditional notation. This was a commission for very accomplished performers, but not necessarily for people who would be accustomed to performing off of drawings. I was concerned the graphic score would be a distraction that could keep the piece from being taken seriously. Ultimately, though, I realized it was really restricting me to write the necessary bar lines and rhythms, and it ended up looking way more complicated than it sounded. Do you use this type of notation often? I think my first graphic scores were back in 2002, when I was writing for a band called Nurse Kaya that I had with some friends. I've used non traditional notations a number of times since then, but probably about 85% of my music is written the normal way. What challenges does this type of notation present to you as the composer? What rewards does it offer you as the creator of this music that traditional notation doesn't offer? First of all, we need to recognize that every form of notation, including the standard one in use for hundreds of years, is a graphic score. Music written down in any fashion is a graph, depicting sound frequencies (pitch) over time. There are other variables (dynamics, articulation, etc. ), but all scores are expressions of a graph. With this in mind, it becomes possible to see that for certain techniques, traditional notation may not always be the best choice. What I've found with pieces like "Drift" is that the notation, while at first kind of bewildering, actually makes it a lot easier for the performers to make music. It enables listening rather than counting, and connecting and responding with each other, rather than trying to anticipate someone else's rhythms or assert your own. It can be very freeing. Especially in the case of this piece, which makes room for some gently guided improvisation for the three musicians. Isn't it interesting to learn about the process behind creating music? Which of the images are you most excited to hear? Do you think you'll be able to tell what we're playing in the concert? We discussed how long this passage should last in rehearsal a few times. In the end, it just happens the way it happens! Initially this page probably scared us the most. The first time we played it it was a disaster, but it's amazing how it always works out. Meet Elizabeth, and her family. We have enjoyed having Elizabeth Ramos (violin) perform with us so much this season! When we asked her to play this upcoming concert with us, she was giddy with delight. It turns out that one of the pieces on the program holds a special place in her heart, and this is her first opportunity to actually play it. She has graciously shared this story with us today. Elizabeth comes from a family of musicians. Both of her parents play in the St. Louis Symphony. Her mom is a cellist and her dad is a violinist. Both of her siblings are also musicians. What is it like to grow up in a house full of string players? She gives us a little glimpse in her story. In my parents house, my mother has a studio that is cluttered with dusty cassettes, decaying volumes of music, and every type of random artifact you could imagine, ranging from decade old used strings to broken splintering cello chairs. It is here that I would come in my adolescent years to rummage through old bins of recordings and thumb through yellowed, flaking pages of chamber music. Mixed into the hodgepodge of musical paraphernalia I would frequently come across live recordings of my parent's performances, some from only a few months prior, and others extending as far back as their conservatory days in the 70's. Perhaps early on I had a deep seated sense of parental pride, or more likely it was just an inquisitive child's curiosity, but more often than not I would find myself specifically combing through the familial stacks of long forgotten cassette tapes labeled "Carmen Fantasy, 1987," or "Brahms Double, 1993." Elizabeth on the far left, with her sibling playing together. Every find would be a secret bonanza, to be confiscated and listened to over and over again while doing the dishes. (The kitchen had the most easily accesible stereo.) It was during one of these "snooping" sessions that I came across a cassette tape of the Schumann Piano Quintet with my father playing first violin. To a child's ears, it was magnetic. During the after dinner dishes that evening, I dragged my little brother into the kitchen and forced him to sword fight with a spatula and a wooden spoon to the Scherzo, and play acted a long, drawn out melodramatic death accompanying the slow movement. For the next year it was the only recording that played during our dish washing listening sessions. Eventually we memorized our own made up lyrics, usually consisting of comedic insults and ridiculous dialogue, frequently interrupted by bouts of giggles and laughter. Throughout the years I've held this chamber work in the highest regard, not only for it's masterful brilliance, but also for the nostalgic quality it inspires. This will be my first time performing the Schumann Piano Quintet. Come hear Elizabeth play the Schumann Piano Quintet next Friday! Maybe she'll swing a wooden spoon at you during the Scherzo. this post written by Dana Our next concert, Voyage, features a very famous piece by the famous composer Arnold Schoenberg. Verklärte Nacht, or, Transfigured Night. Written for string sextet (2 violins, 2 violas and 2 cellos) the piece is based on a poem of the same name by Richard Dehmel. The poem is quite intimate and powerful, and had a big effect on Schoenberg. So big, it inspired him to write one of his most famous works. After writing the haunting, passionate and beautiful Transfigured Night, Schoenberg turned his music, and the world of music, on its head by writing some really crazy stuff, notably Pierrot Lunaire, which is being performed this Wednesday by members of The Saint Louis Symphony at The Pulitzer if you're interested. But back to Transfigured Night. As you might know, we've been creating art posters for each of our concerts this year, and I felt that this poem had such rich imagery I really wanted an artist to do something with it, and luckily, I had just recently met a wonderful artist - Holly Gollwitzer-Gregg. I pitched it to her and she said yes! Here is the result! Here is the poem, courtesy of Wikipedia, where you can learn more about the music too if you'd like. There are also some fantastic YouTube videos of it. This one gives a moment by moment description of how the music and the text fit together. „Das Kind, das Du empfangen hast, sei Deiner Seele keine Last, o sieh, wie klar das Weltall schimmert! Es ist ein Glanz um alles her; Du treibst mit mir auf kaltem Meer, doch eine eigne Wärme flimmert von Dir in mich, von mir in Dich. “Do not let the child you have conceived be a burden on your soul. Look, how brightly the universe shines! Splendour falls on everything around, you are voyaging with me on a cold sea, but there is the glow of an inner warmth from you in me, from me in you. Die wird das fremde Kind verklären, Du wirst es mir, von mir gebären; Du hast den Glanz in mich gebracht, Du hast mich selbst zum Kind gemacht.“ Er faßt sie um die starken Hüften. Ihr Atem küßt sich in den Lüften. Zwei Menschen gehn durch hohe, helle Nacht. That warmth will transfigure the stranger’s child, and you bear it me, begot by me. You have transfused me with splendour, you have made a child of me.” He puts an arm about her strong hips. Their breath embraces in the air. Two people walk on through the high, bright night. FEB 22, 7:00pm at The Saint Louis Art Museum Art After 5 series.Call 314-721-0072 to reserve your free tickets. MARCH 1, 8:00pm at The Chapel Venue. $10 in advance, $15 at the door. Includes 2 drinks. Click here for advance ticket purchase. Stay tuned, we're going to have Voyage stories from our musicians in the next post! Today we launch our "Countdown to 2013" donation drive! We love bringing music to our community - and we need your help to keep it coming! Help us establish ourselves as a permanent fixture in the music scene here in Saint Louis by making a donation. We call it, "Becoming Part of the Project" because when you donate to us, you really are an integral part of what we do and you join the circle of people who have come together to make our concerts a part of their lives. So, this thing called music costs money. Quite a bit of money. Our focus is to present the best musicians our town has to offer in intimate, casual settings where you can get to know the musicians, as well as the music. We go out of our way to use locally owned businesses for the services we need as much as we can. (All of our printing is done by locally owned printers - The Ink Spot on Hampton and Paperkeet on Morganford). We put together this little flyer to send out with our snail mail campaign - scroll down to see our "contribution menu". The first advice we got from an adviser who helped us set up our non-profit status was that our financial foundation would come from lots and lots of small to medium donations. Not from grants or big flashy donations. And she was right. We have received some very generous donations, for which we are incredibly grateful. We've received our first grant, and look forward to more in the future, but what we really seek is for the community to chip in what they can to help make music happen in their community! Take a moment and visit our PayPal link and become a Part of the Project! First of all, congrats to everybody on a wonderful concert Saturday afternoon at Forest Park Community College. I was happy not to be playing for once, so I could sit and enjoy the awesome music! It was a great program and a great crowd, and Adrianne, Melissa, Jen, Dana, and Nina outdid themselves. Can you believe it's already 2012? 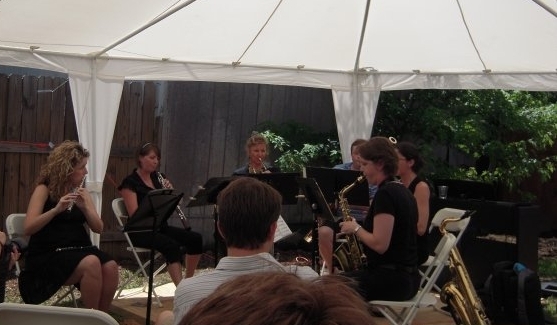 We have several more concerts scheduled, all the way into June, BUT what you may not know is that we are already starting to plan the 2012-2013 season. This is my first year being involved in the planning and I wanted to share with you a bit of how this gets started. After all, with (now) eight musicians and virtually endless repertoire possibilities, how on earth can we narrow it down to approximately six different programs? Well, honestly, I can't answer that question. It seems like a truly daunting task! What I can do is tell you a little about our meeting last Monday. We got together for lunch and brainstorming about next season's repertoire. Everybody was instructed to make a list of pieces they wanted to play, along with the timing and instrumentation (meaning, is it for violin, saxophone, piano? Or what?) of each piece. You can see somebody's notes in the background, if you squint, but most importantly you can see brownies! I personally had a hard time focusing on the meeting due to the presence of the brownies, but that's just me. After we ate lunch, we went around the table and talked about various pieces we each wanted to perform. This is all a new process for me, but I was told it works best to come up with the longest work or most involved work and then plan the program around that. Having a theme (for instance this year we had concerts called "Combinatorics" and "Folk Freedom") helps too, as then we can choose repertoire based on that them for the concert. We brainstormed a few concert themes, and talked about some larger pieces that would be the bread and butter of those concerts. Another thing we have to keep in mind is that not all of our venues have a piano, so we need a few programs without piano. Everybody had a chance to put in their input and we took many notes. I personally was shocked by how knowledgeable everybody is about various composers—many that I had never heard of! You can see Dana getting very animated about something! You can also see that the other end of the table hadn't finished all of their brownies, and again, this was distracting to me. How can they be talking when there are BROWNIES in front of them? After about two or three hours we had to wrap up the meeting. We probably ended up with five or six concert themes and numerous pieces suggested for each one. It was a very successful meeting! The next step is narrowing it down to a series of programs that is a good length, interesting for the audience, and not too challenging for any one musician, and Laura and Adrianne will be doing most of the work on that, I think. It helps to have eight people, but sometimes it's better just to have a couple people working together. Did you think I would tell you anything we have decided? I can't do that! I am sworn to secrecy not to give anything away (okay, and we really haven't finalized anything yet!). I do know that next season is going to be even better than this season, and that's a tough act to follow, in my opinion. So, what do you want to hear? If you have attended concerts this year, what has been your favorite piece so far? We'd love to hear from you in the comments!